Glas is mostly known for its Goggomobil microcar. However, in 1964 they decided to get into the sports car business and introduced the Glas 1300GT coupe and later, this car, the 1700GT. The 1700GT was designed by Pietro Frua. 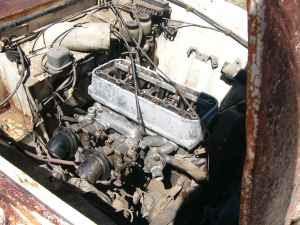 The engine is a 1,682cc SOHC 4 that produces 105 HP. This engine was the first automotive engine to use a timing belt (as opposed to a chain). 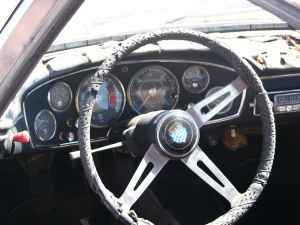 BMW took over Glas in 1966 and continued this car for awhile with a BMW 1600cc engine and BMW badges. Pictures don't do these cars justice. For the past few years I've seen a couple 1700GTs at Lime Rock's Vintage Fall Festival and "German Car Day" at the Larz Anderson Museum of Transportation. They are gorgeous in person. Somewhere in the neighborhood of 800 Glas 1300 and 1700GTs were built before BMW took over and changed the name and engine, making this a very rare car. The asking price for this car is just $900.00. 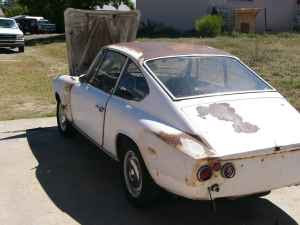 If you have the time and talent and are looking for a serious project, this would be a great car to restore. 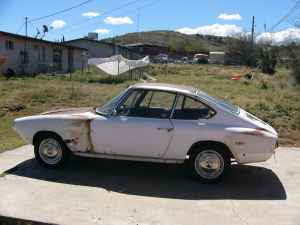 Located in Oracle, AZ, click here to see the Craigslist ad for this car.